It is as simple as copying-and-pasting the Youtube link on the links section on the property listing. In many cases agents other than the listing agent in an office would work on a property or would want to capture a quick note so that everyone can see it. Until now, only users with admin rights or the listing agent alone could do this. 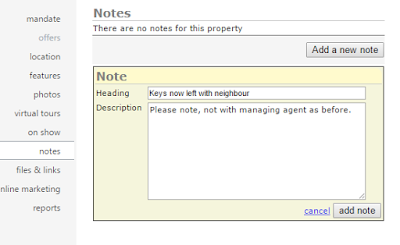 We've now opened up the property notes so that standard users can add notes on any property listing within the office (except for users with read only access). Only the listing agent, or users with admin rights would however be able to delete notes. A improved interface to partner property portal, IOL Property, is now live. 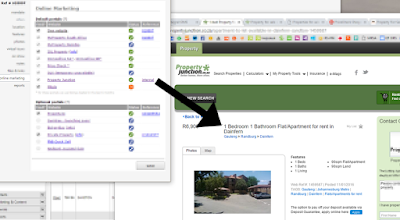 Users are now also able to select or deselect the updates of property listings to IOL Property. Simply open a property listing in the OMS, and select / deselect the option to export the listing to IOL Property. IOL Property updates listings once a day so allow up to 24 hours for the listing to appear. 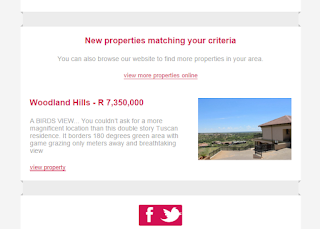 We will perform a bulk update of listings via the new interface to IOL Property over the next 24 hours. Listings updated within the last 6 months will automatically be selected for export, while you have the option to manually select older listings to IOL Property. The Mitula portal will be selected by default and you have the option to select or de-select the portal at any time. We will perform an automatic bulk update of listings to Mitula over the next 24 hours. Listings you've updated in the OMS in the past 6 months will automatically be exported. For older listings, you will still have the option to open the listing, and manually select to update to Mitula. Listings are updated to Mitula once a day. We've corrected an issue in the OMS with the capture of Game Farm / Lodges property types. You are now able to enter the number of bedrooms, bathrooms etc when this property type is selected. 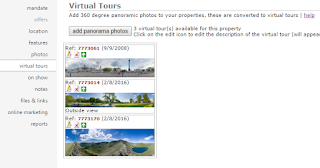 Under the OMS Virtual Tours we removed the previous Java virtual tour uploader (which became problematic with the latest browser updates) and replaced it with a similar interface to the standard photo uploader. If you run a Flex real estate website and have the property alerts option enabled, subscribers will get new property listings from your office either ASAP, daily or weekly. We've enabled a filter to only publish listings to the property alerts where photos are available on the listing. This creates a more professional looking email and more value for subscribers. The property description is now a minimum requirement on the OMS for property listings to appear on external property portals. Most portals already have this minimum requirement in place.